Tottenham midfielder Dele Alli has lavished praise on Chelsea’s Callum Hudson-Odoi after his displays for England earlier in the week. The Chelsea youngster was handed his senior debut by Gareth Southgate and he managed to impress. 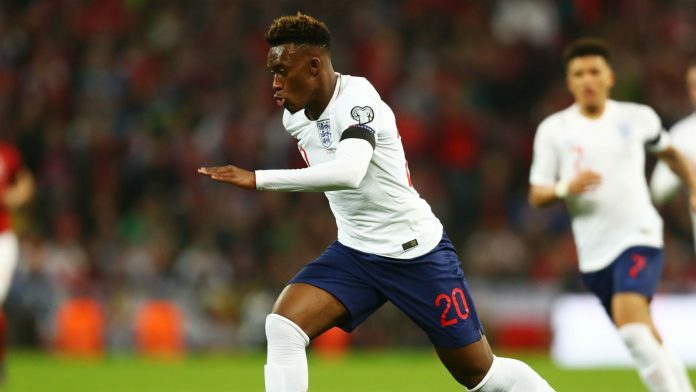 Hudson-Odoi seemed sharp and confident for England against Montenegro and Alli believes that he is a fantastic talent. The Tottenham star also hailed the Chelsea ace as an entertainer. He also praised Jadon Sancho for his performances. “They’re both fantastic players,” said Alli, as quoted by the Evening Standard. “They’re still young but have already proven they can cope at this level. I’ve seen them in training and they’re amazing one-on-one and things like that. “They’re entertaining to watch which is great for the fans. But at the same time, they’re great team players I’ve played against Callum at Chelsea, been watching Sancho play for Dortmund and what he’s been doing has been great. Hudson-Odoi will be hoping to cement his place in Chelsea’s starting lineup now. He has been in and out of the squad all season. Although he hasn’t had too many starts under Sarri, he has managed to impress during his cameos. The youngster showed last night that he is ready for the top level and the Chelsea boss should consider him as a starter for the remaining games. The likes of Willian have underperformed this season and giving Hudson-Odoi a chance will only benefit the side and the player.